Director Tomas Alfredson's adaptation of John le Carré's best-selling novel is planned for Blu-ray in March. 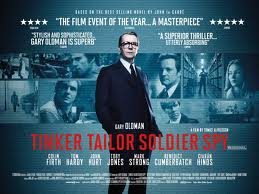 In an early announcement to retailers, Universal is working on 'Tinker Tailor Soldier Spy' for Blu-ray on March 20. The star-studded thriller stars Gary Oldman, Colin Firth, Benedict Cumberbatch, Tom Hardy, Mark Strong, and John Hurt. The Blu-ray/Ultraviolet Digital Copy will feature a 1080p video transfer, a DTS-HD Master Audio 5.1 soundtrack, and supplements include: Feature commentary with Tomas Alfredson and Gary Oldman; behind-the-scenes featurette; Interviews with Tomas Alfredson, Peter Straughan, Gary Oldman, Colin Firth, Tom Hardy, and author John le Carré; and deleted scenes. You can find the latest specs for 'Tinker Tailor Soldier Spy' linked from our Blu-ray Release Schedule, where it's indexed under March 20.